Negotiators from 12 Pacific nations have finished a week of talks without agreement on a regional trade deal. But the US trade representative Michael Froman said ministers were more confident than ever that a deal on the proposed Trans-Pacific Partnership was within reach. He said it would support jobs and economic growth. Among the sticking points were issues relating to the automobile sector and access to dairy markets. No date has been set for the next round of talks. Mr Froman said "significant progress" had been made in the discussions on the Hawaiian island of Maui. He said work "will continue on resolving a limited number of remaining issues". Australian Trade Minister Andrew Robb said "98% is concluded," blaming the "big four" economies in the group - the United States, Canada, Japan and Mexico - for the failure to reach a final deal. New Zealand Trade Minister Tim Groser was upbeat after the talks on the Hawaiian island of Maui. "The undergrowth has been cleared away in the course of this meeting in a manner that I would say is streets ahead of any of the other ministerial meetings that we have had," he said. New Zealand has said it will not agree to a deal unless it significantly opens up dairy markets. Japan's Economy Minister Akira Amari singled out intellectual property rights as an area on which agreement had proved impossible. Drug patents are another divisive issue, setting the US at odds with all the other countries, said one participant quoted by Reuters news agency. 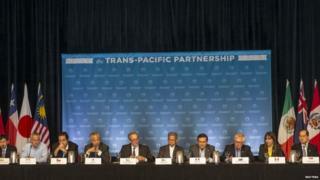 The TPP will encompass 40% of the world economy. But the latest delay means that any agreement is now unlikely to have time to gain approval in the US Congress before the elections this November and the end of Barack Obama's presidency. The US, Japan, Brunei, Malaysia, Vietnam, Singapore, Australia, New Zealand, Canada, Mexico, Chile and Peru are taking part in the talks. Do you run a business dependent on trade between the Pacific nations? Would a deal affect you? You can share your experiences by emailing haveyoursay@bbc.co.uk.